North Andover’s Osgood Hill Conservation Area contains over 3 miles of trails that connect to many more miles of trails on other properties, frontage on Lake Cochichewick, and a historic building, the Stevens Estate, which the town owns and uses for events. The forest is a popular destination for dog walkers, hikers, high school cross-country runners, and school field trips. North Andover decided to hire a forester to write forest management plans for some of their properties, including Osgood Hill. In 2013, the town used a DCR Stewardship Grant to implement an educational timber harvest and invasive species control on a prominent section of the forest. Residents of suburban North Andover usually have little experience with forest management and timber harvesting, so the town Conservation Administrator, Jennifer Hughes, collaborated with the former fire chief and other town officials to promote the project on local news and explain the benefits of forestry to the public. Along with the timber harvest, the town used the grant and volunteer time from the town’s public works department and Friends of North Andover Trails to control invasive plant species such as oriental bittersweet and Japanese knotweed in parts of the forest. At first, the timber harvest seemed to many like a drastic change. But over the next few years the benefits became clear as young trees began to grow in the openings left from the harvest. The invasive species removal was partially successful as before the entrance to the forest was overridden with invasive plants, now that section of the forest is primarily native species. They were unable to control one patch of Japanese Knotweed although the density of the patch is diminished. 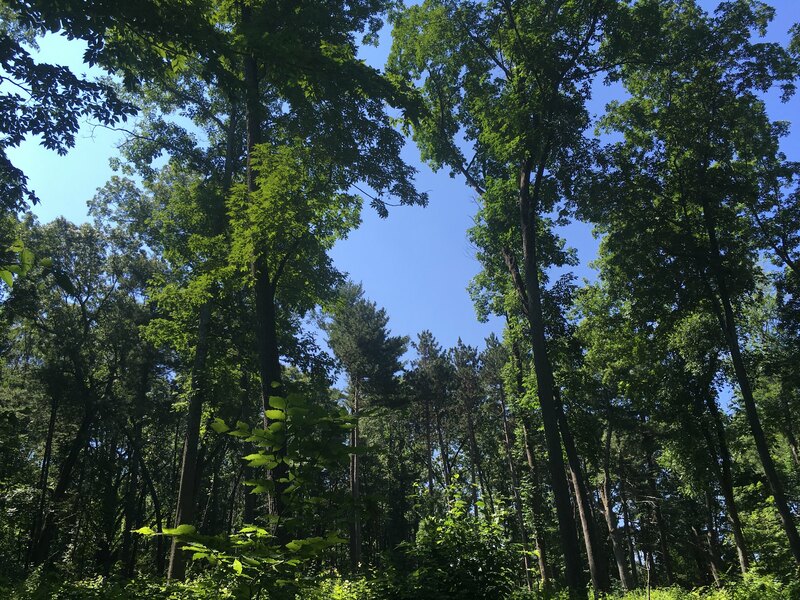 The forestry project on the Osgood Hill forest was so successful that the town conservation employees hope to do more forest management on their properties. One prominent feature in the Osgood Hill Conservation Area is Lake Cochichewick which is the town water supply. About half of the shore of the lake is lined with homes and owned by families, so the forest is one of only a few places where the general public can access the lake for recreational boating, fishing and just enjoying the view. Another benefit that the town received from working with a forester was that he identified and marked large “legacy trees,” large trees that were likely growing on the site for over 100 years, near the lake which are now all labeled on a map for visitors to find. The trees are used for scavenger hunts for elementary school field trips and are a fun way for visitors of all ages to engage with forest ecology and tree identification. The town of North Andover has already engaged a forester to prepare a forest management plan for one of its other properties, and plans to continue managing their forests for timber, recreation and education into the future. To find a forester working near you, click here.